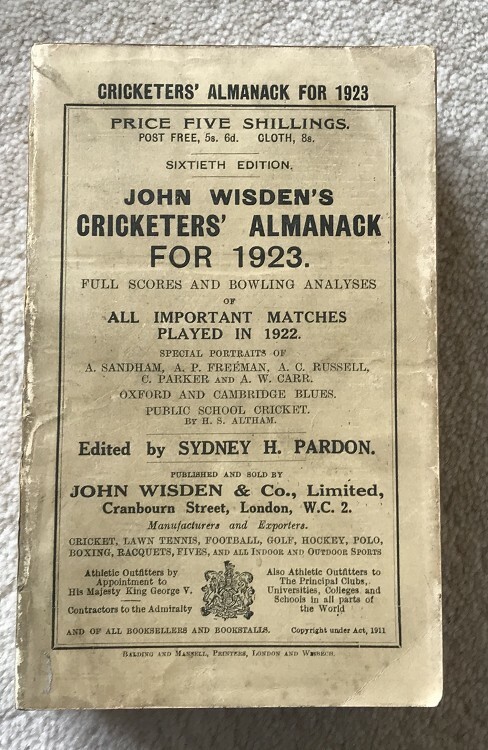 This lot is an Original 1923 Wisden Paperback with facsimile spine. This is in Good to Very Good condition, the covers are nice, clean and tall. They are a touch dark with a bit of wear to the outermost edge. The rear cover is also a touch dark. A nice new spine with text has been added , it is neat and tidy but not an exact copy of an original Wisden. Excellent inside with clean pages and tightly bound. Martin Wood sticker to the first page. Clean page block and an excellent photoplate.